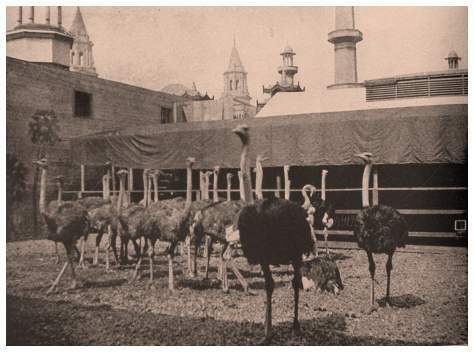 The Ostrich farm with a drove of sixty birds averaging from 250 to 450 pounds at the World's Fair. The birds were brought in from a Southern California ranch. 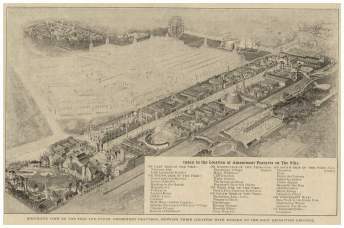 Fair patrons could walk and view the birds from outside their cages. Guides explained everything pertaining to these ornithological giants: the characteristics of the birds, how the magnificent plumage is produced, how they raise their young, and many other facts, such as: the ostrich produces thirty to thirty-six eggs a year, and its brain is the smallest of any creature, relative to its size. The height of the sixty birds on the ostrich farm varied from ten to eleven feet. 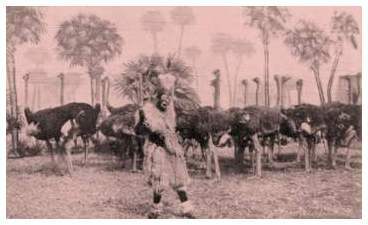 An ornery ostrich named- "Black Demon" was the alpha male of the farm. At the time, the sale of Ostrich feathers was very much in demand in southern California.